The first thing you need to know about livestock auctions is they start promptly at 6:30 p.m. None of this fashionably late nonsense — these guys and gals mean agribusiness. The volunteers parking cars have a handful dealing with obstinate drivers (you know who you are), so leave early and don’t be surprised if you park along the fence or near the exit. Next, remember which barn the auction is being held in — then again, if you’re late, the amplified voice of the auctioneer will steer you to the right building. 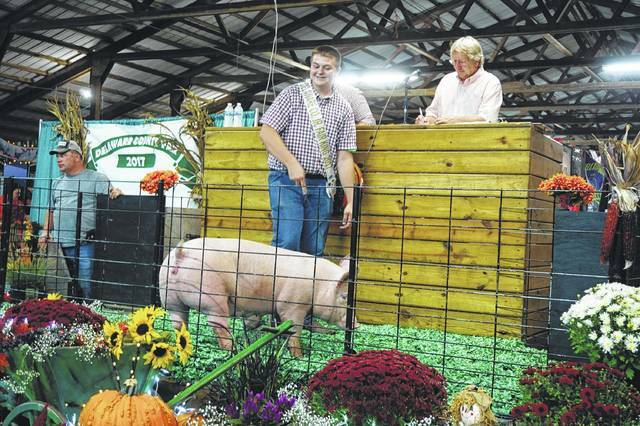 Wednesday night’s Swine and Lamb Sale at the Delaware County Junior Fair was a typical livestock sale, which always starts with the champions, who usually, but not always, fetch the highest prices. Some of the animals are bought by a single buyer, and some are bought by several buyers, all of whom are named. You’ll hear the auctioneers ask if the buyer wants to process (eat) the animal, or resell it, giving the 4-H club member another year with the pig or lamb. Now if you want to keep score, you’ll need the brightly-colored, stapled handout that lists the rules and all the exhibitors. You should have received that when you entered the building. Some of the audience, whether they’re proud parents, buyers, or bystanders, are also keeping track, and they’ll kindly let you see what the champions received for their animal and who bought it, so you can mark it down on the early sales. Then again, it’s really hard to keep track of the 100-plus transactions, so don’t be surprised if you end up with a few blank spots on your handout when the night is over. There’s a separate list of the buyers, who you’ll be able to recognize as holding a yellow numbered card up whenever they want to bid. The auctioneers work as a team, relaying the bidding information to the announcer, who starts with a minimum bid and goes into a fast-paced chant, always wanting to get the highest price for the young exhibitors. The exhibitors, some not much taller than their lamb, do their best to control the animal, holding its head and positioning the hind legs. For the pigs, the exhibitors would persistently tap their animal with a stick to lead it around the pen. Parents remind their children to smile while displaying their animal. After the animal is sold, the exhibitor will thank the buyers and present them with a gift bag or gift basket of goodies, such as candy or a jar of horseradish. You want names and numbers? Zachary Price had a bid price of $2,000 for his Champion Market Gilt. Hunter Jones received $1,400 for a Reserve Champion Market Gilt. Nate Johnson got $2,200 for his Champion Market Barrow. Caleb Yarnell received $1,300 for his Reserve Champion Market Barrow. All four exhibitors were from Delaware. The minimum bid price for the 107 swine was $550. Caleb Durheim of Fredericksburg had a bid price of $2,100 for his 131-pound Grand Champion Lamb. Trenton Day of Delaware got $2,000 for a Reserve Grand Champion Lamb. The Graham sisters of Sunbury — Emma and Audrey — received $1,900 and $1,500, respectively, for their pen of two Grand and Reserve Champion lambs. Oh, one last thing — the auction doesn’t necessarily end with the last exhibitor. As you’re walking out, you might hear the auctioneer say that all of the lambs received a minimum of $650, thanks to Forman Realtors of Sunbury.